Ruchie Freier, fourth from left, with the women of the Ezras Nashim volunteer EMT corps. Photo by Julieta Cervantes. At a time when the women’s empowerment movements #MeToo and Time’s Up have dominated the news, the documentary 93Queen couldn’t be more relevant. 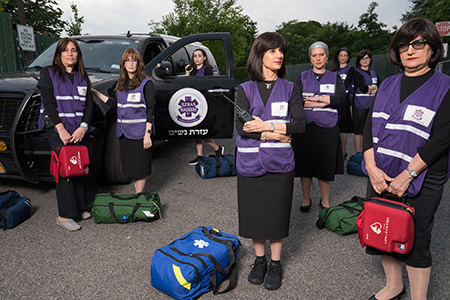 It’s a David versus Goliath story of a group of Hasidic women in the Borough Park section of Brooklyn, who defied the patriarchal status quo to establish Ezras Nashim (whose logo includes the slogan “women for women”), the first all-female volunteer ambulance service in New York City. 93Queen, Paula Eiselt’s debut film, which opens theatrically in New York on July 25 and August 14 in Los Angeles and will premiere on PBS POV on September 17, follows founder Rachel “Ruchie” Freier and her squad from the creation and launch of Ezras Nashim through the group’s first year as an official ambulance corps. 93Queen is the code that New York emergency dispatchers gave to the squad. Eiselt, who is modern Orthodox and has family connections to the Borough Park community, recorded the members of the squad for four years as they trained to become EMTs and battled the all-male, politically powerful machine that is Hatzalah—the largest volunteer ambulance corps in the world—for their right to exist. Do you welcome financial contributions from other Jewish women who support the work you are doing? I grew up in Miami Beach, and many of my classmates were Hasidic girls. Now I live in a rural community where for years I was the only Jewish woman. My synagogue is in Jacksonville, FL. I am a 3rd generation Lifetime Hadassah Member, and I worked in forensic mental health for many years.